Tying lamb racks with loops of butchers twine tightens & compacts the meat, giving it the iconic round shape instead of an elongated oval. 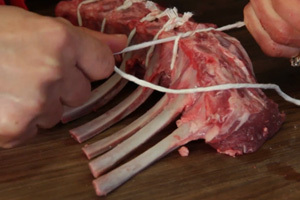 For a prettier presentation, further trim the meat between the bones to turn the rack into a “lamb spider rack” (how to). Tie a loop around the meat between the first and second rib on a side. Pull the twine tight until the meat becomes more tube-shaped within the loop. Tie off the loop, cut off the excess, and repeat with another loop between the next set of bones. Repeat as necessary until there’s a loop of twine in every gap between bones. Roast the lamb rack as you normally would, though note that it may take slightly longer to cook than an un-compacted rack. When the rack comes out of the oven (before or after the rest), cut and remove the twine. Serve whole or slice into chops as you normally would.